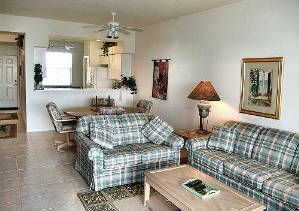 If you would like to Rest and Golf in a Beautiful Floridian setting, then this unit and Community is just what your looking for! In addition to a swimming pool steps away and one at the club house there is also another at our Beautiful lodge which also has a Tiki bar. 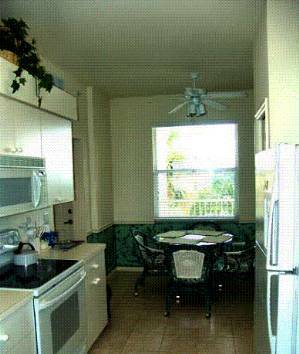 This is a third-floor Condominium unit in an Elevator Building located on Queen Palm Lane. The Master Bedroom Looks onto the 17th Fairway and a 38 acre lake. 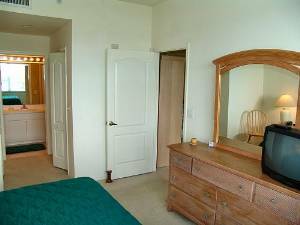 There are Two Large walk in closets and an adjoining Master Bathroom. Pictures are available by clicking to the right (Photo Gallery). Please check availability calendar (Top left) which is up to date as of 7/12/2011. Heritage Palms Country Club is a gated community in Fort Myers Florida that boasts a 28,400 square foot clubhouse with a picturesque view of the centrally located 38 acre lake. Within the clubhouse is a restaurant offering formal and informal dining, locker rooms, pro shop, media room, heated swimming pool, spa, cabana, lighted Har Tru tennis courts with stadium court and tennis center/fitness center, aqua driving range, putting and chipping practice greens. A unique feature of Heritage Palms Country Club is a golf course for the millennium. The Azinger/Lewis Design features two 18 hole, championship golf courses, which can be considered among the best in Southwest Florida. It's aqua range is serenely situated around a 38 acre lake, along with 36 golf holes and the majestic clubhouse. The Grand Entrance to Heritage Palms Country Club is one of the finest in Southwest Florida. The boulevard entrance focuses on a 12 foot high waterfall that cascades down to a rock pool. Cradled above the waterfall is the setting for one of the golf course tees. A palm lined inlet welcomes you at the entrance off Six Mile Cypress Parkway. Residents enjoy views of manicured greens, tropical preserves and glimmering lakes throughout the community. Secure Broad Band Internet Connection from Comcast. Secured Unlimited Phone Service throughout the continental U.S, Canada & Puerto Rico. Living room area contains a queen size pull out sleeper and a love seat in addition to a Lazy Boy rocker. Some amenities include TV and CD Player, Stereo with a CD player. The Dining area is adjacent. Enjoy the comforts of home in this kitchen which contains all amenities that you would have in your own home. This includes a Dishwasher for your convenience for a quick cleanup. The Master bedroom has a King size bed and dresser, nite tables and TV. Two walk in closets are in the master suite and the master bathroom which is attached includes a stalled shower. 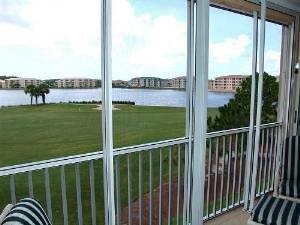 This South East view from the Lanai overlooks the 17th fairway and one of many lakes. Enjoying a nice cup of coffee/tea in the morning hours is breathtaking. This South West view from the Lanai overlooks the 17th fairway and the main lake Enjoying a nice cup of coffee/tea in the morning hours is breathtaking. 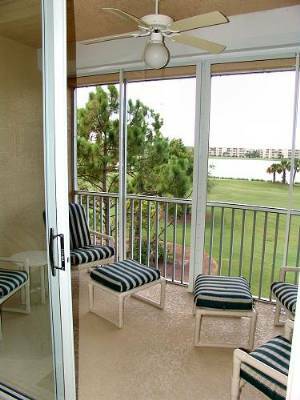 My wife and i rented this condo for two months in 2007.The unit was very enjoyable-well furnished,great view,and fabulous landlord.I would recommend this unit to anyone who is interested in golf,tennis,exercise,swimming,and quiet environment-we loved it! Deposit: A 20 % Deposit is due at lease signing. Refundable Security deposit, rental fees and any other fees related to the rental are due 60 days prior to the start of the lease.